This week the Brumbies refined their pack up times and embraced the onset of winter in the desert. 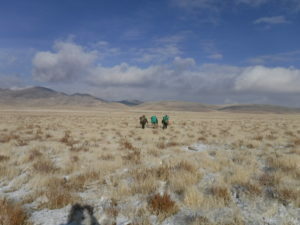 We had two snowstorms and two hikes across beautifully snow-frosted desert terrain which the group crushed in record hike times. Three students saw their parents this week, which included powerful moments for everyone. Two students got tokens, and one student got his trail name: Strong Warrior. A few nights there were clear skies and we saw the sky sprinkled with stars before we hunkered down in our bell-shaped tent with a wood-burning stove. The Ulurus, had an exciting long hike day Saturday and two parent visits that went excellent. They had a fun snowball fight on the hike and did a Peak hike Wednesday and at the peak of the mountain had a naming ceremony for one Uluru, a goodbye ceremony for another and a token ceremony for Ziggy, one of our lovable dogs. It was an exciting week in the Gnowees. The girls completed a leadership challenge where they had to lead themselves from morning until the night without any help or interference from the staff. The ladies rose to the challenge and were able to get the group packed up and navigated their way to the next site all by themselves. The group honored three of the girls with tokens and one student had a happy reunion with her parents during her parent visit. This week the boys worked a lot on group dynamics. They are working on coming back together after a couple of students left, and are doing great. They were snowed on twice this week, and they all handled it well together and are enjoying the tents with wood-burning stoves. Two of the newer students are almost out of first camp, and are very excited about it.